One of my daughters can hear things being discussed halfway across the house, especially when it has to do with something she likes to eat. 🙂 During the school year, both of my daughters usually have cereal and yogurt for breakfast. On the weekends, however, we try to do something different like pancakes, fruit, granola, eggs & bacon, or something that always brings a smile: gluten-free waffles! Our go-to brand has been Van’s Natural Foods, for as long as my daughters and I have been gluten-free. Van’s makes many types of waffles so please note that some are NOT gluten-free. Their gluten free varieties are: totally natural, buckwheat, blueberry, apple cinnamon, flax and plain minis. And besides waffles, they also make gluten-free cinnamon french toast sticks. All of these products are made with whole grains and are also egg and dairy free, plus the waffles are sweetened with fruit juice. The boxes are clearly labeled “wheat/gluten free” so just make sure you grab the right box. A while back I gave away a few “free product” Van’s coupons on Facebook and was amazed by the number of people who wanted them. That prompted me to contact Van’s to see if they’d like to offer free product coupons for this giveaway along with an honest review from Yours Truly. They generously agreed and also sent me a few coupons to use for this review as well. As I noted above, we have already tried and enjoyed a few types of Van’s gluten-free waffles (totally natural and apple cinnamon) but I was excited to try a few more varieties — along with my girls, of course! The second variety I’d like to call out are their plain minis, shown below. There are 32 of these cute little guys in each box and they are attached to each other in sets of 4 for easy toasting. You just pull or cut them apart after they are heated up. They’re the perfect size for dipping into syrup and whipped cream — our favorite way to eat both waffles and pancakes. Again, like the larger muffins, these also had a light, crispy feel and a naturally sweet taste (must be the fruit juices they use). 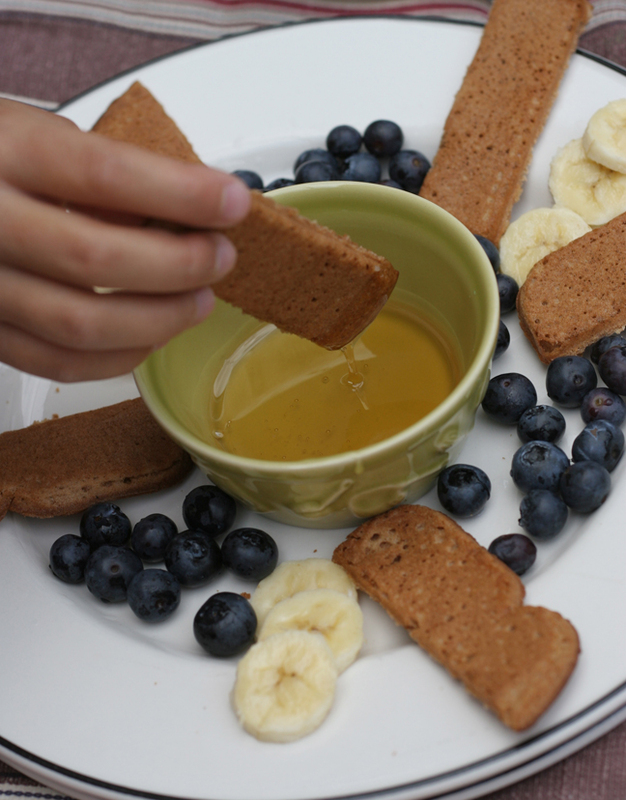 These are super easy to top with jam, peanut butter, nutella, syrup or fruit slices and are a fun size for little hands. And now for the giveaway: Five random winners will each win TWO “FREE PRODUCT” coupons (retail value up to $3.50 each) courtesy of Van’s Natural Foods. U.S. and Canadian residents may enter. Giveaway ends at midnight on Sunday, June 3, 2012. Then the 5 winners have 24 hours to get back to me, otherwise new names will be chosen. U.S. and Canadian residents may enter. Good luck! Disclaimer: Van’s sent me a couple of free product coupons to use for this review. In return I only promised an honest review and was not compensated in any other way. Opinions are my daughters’ and my own. We LOVE Van’s Waffles! Not too creative around here … my son likes to eat them plain, and I eat them with maple syrup. In the past we have “decorated” them with strawberry cream cheese and made a face on them with blueberries. That’s it for us. Would love to win some free product coupons! Thanks for the opportunity! i would make the van’s waffles with strawberries and whip cream on top. with two little girls newly diagnosed with celiac – this would be a treat! We love Van’s products especially the French Toast sticks. When we switched to GF diet after my daughter was diagnosed the meal we struggled most with was breakfast. Once we found Van’s we were thrilled. My daughter loves to eat the waffles (full sized and any flavor) like the French toast sticks. We cut them into strips and she dunks them into syrup!!! Topped with Greek yogurt and berries would be a delicious way to eat them..My boys love waffles and we are just going gluten free so this would be nice to try. Our favorite way to eat them is toasted with peanut butter on top! Mmmm! Strawberries and whipped cream sound great! 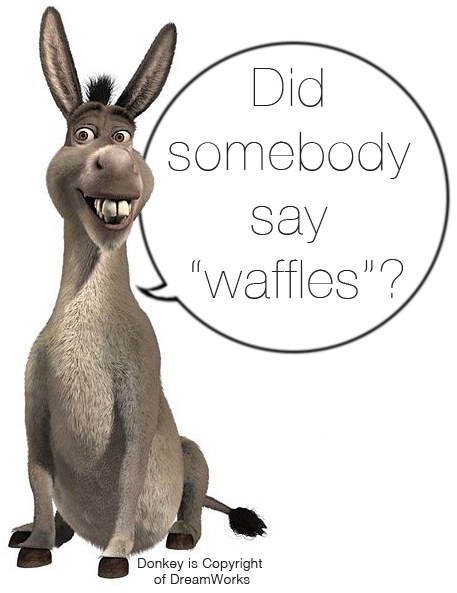 We have not tried this particular brand of waffles but would like to try them! We like waffles with peanut butter or applesauce. 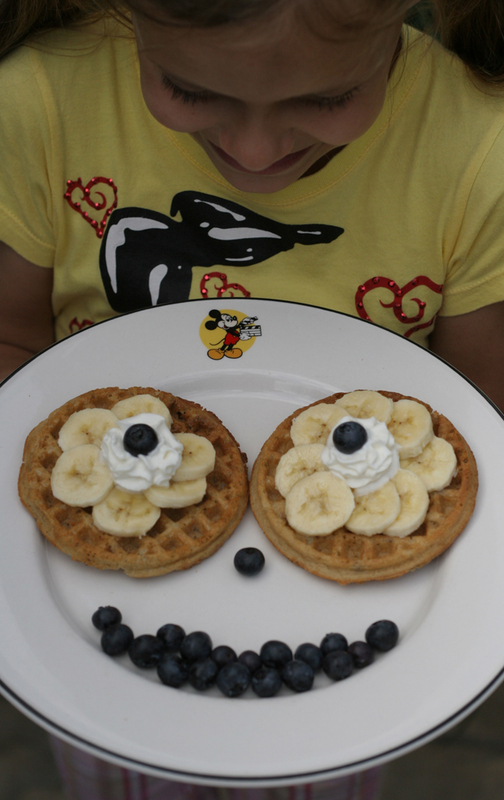 My daughters and i love turning waffles into seasonal shapes. This year we made a great pumpkin out of raspberries and banana accents for halloween! Would love to see the minis and fench toast in our area! Just wanted to say I love all your imaginative ..kid involved creations ! Peanut butter,honey, and original vans gluten free waffle sandwich topped with bananas and drizziled with honey. Perfect breakfast, lunch, or dinner!! My G-Free daughter LOVES the Van’s products! She loves the plain waffles with powdered sugar and syrup, and loves the dip the french toast sticks in syrup. We will have to try them with peanut butter or Nutella….she loves both of those! I love to do something creative with my son’s food. Presentation means the difference between him totally turning his nose up to something vs. gobbling it up!! My son’s favorite is Van’s GF mini-waffles. Sometimes he likes to enjoy a mini pbj waffle with them! They also make great wheels for apple slices. Simply stick toothpicks through the apple and stick the mini waffles on the end of toothpicks – voila – instant apple car! However, what I like most about them is that he likes them plain. Any GF mom knows how hard it is to have an EASY on the go snack that doesn’t take much prep. These fit the bill. We can be running late and warm one of these in the toaster to take with us for a quick breakfast. And they are easy to toast and then take with us in a ziploc for snacks while we are out and about. we love the blueberries and then we add strawberries and syrup. My son likes them with a big pool of syrup to dip! My little grand Camren eats them EVERY morning….with nothing on them!! I love them with blueberry flavored syrup…. I eat a plain one with a soft boiled egg on top! 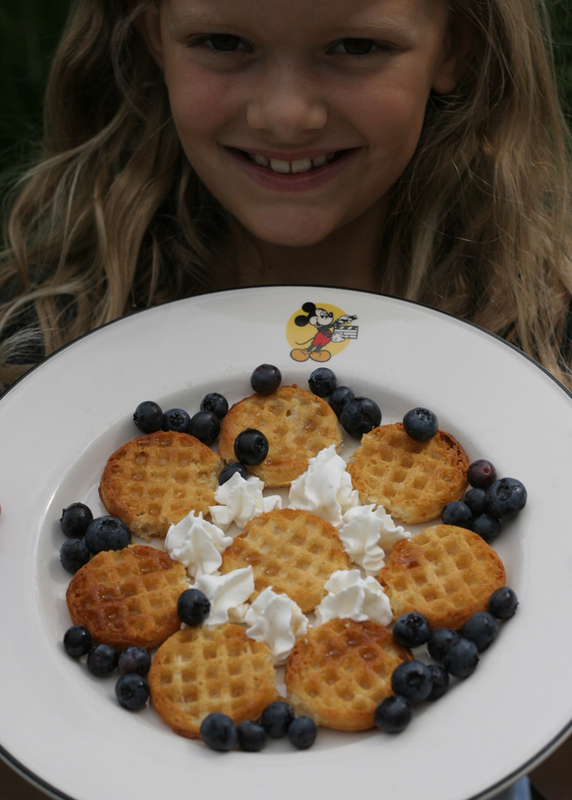 Delicious…..
We love the minis – with blueberries, butter, syrup and whipped cream. My girls eat them everyday! I will top with peanut butter and bananas for my little GF guy! Thanks for the contest! Thanks for the entries, everyone… Regardless of whether or not you won free product coupons, you should definitely try to find Van’s gluten-free waffles and french toast sticks in your area. If they’re not available near you, try sending a request to your favorite grocery store to stock them — your kiddos will love them!